In the blender, add the coconut and red chillies , gind them. Now add roasted chana dal, small onion, salt add water little by little and grind it to a thick, smooth paste. Heat oil in a pan, add mustard seed, when they stop spluttering add urad dal and curry leaves. Always make sure the coconut , you use is fresh, dessicated coconut cannot be used here. I have added small onions , it gives a different taste to this chutney, you can skip this if you want. Sometimes I also add a small piece of ginger to both types of chutney, grinded with green chillies and red chillies, this gives a nice flavor. adding red chillies gives yummy taste..i love it! Nice chutney. Good to eat with red chillies. 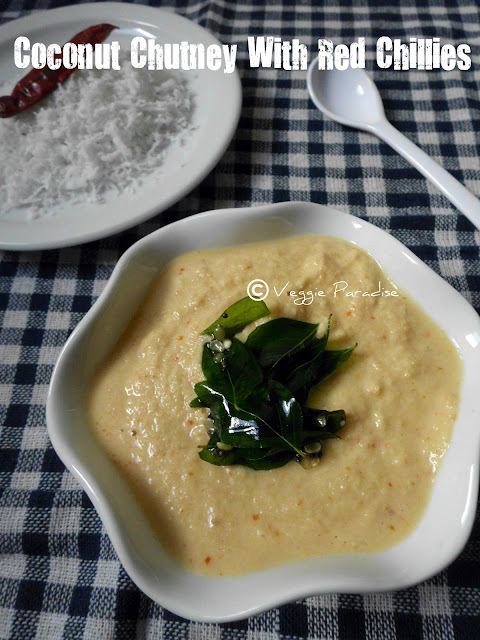 Love this with idlis and dosas.. Sounds great, very nice chutney recipe. இதனுடன் ஒரு பூண்டுப்பல் சேர்த்து அரைப்பேன்...தோசையுடன் சாப்பிட ரொம்ப பிடிக்கும். yummy chutney looks inviitng...love it with dosa!! chutney looks very inviting and i am feeling very hungry now. wow! looks delicious.I used to add a small garlic clove too. thanks for coming over to my blog!...chutney looks yumm! cant do without it! mmmm.... I love this with my breakfast. Lovely snap..
Nice Post!I like coconut chutney with spicy.